Day 312: Playin’ With The Queen of Hearts . . .
We used to love playing Cribbage with Jean’s Mom and Dad before and after we got married. There were epic battles of cards being played and usually it was Jean and her Mom against Brian and her Dad. . .occasionally, we went ‘crazy’ and pitted Jean and Brian against Margaret and Bill. Regardless, it was great fun–with great people–and in retrospect, a perfect way to spend time with family. Even after we bought our first home, we’d have them over for dinner and afterwards a game of cards would break out! Looking back on those years, it seems so long ago and yet it also seems like yesterday. We had some great laughs–amazing conversation–and although we didn’t always agree on everything (imagine that! ), we learned so much from being with them. Family—they shared. Friends—they talked about. Growing up—they helped us understand. We had always been told that when we get older, time will fly by. But, we NEVER believed it; we didn’t believe it because we NEVER thought we’d get older! To this day, we feel like there are times when we’re trapped inside the body of 18 year-olds! Yes, we know, wouldn’t it be amazing! Bill and Margaret were teaching us even as we were thinking that we didn’t need to be taught–all while playing cards. . .and in cribbage, a queen and a five were like GOLD. If you’ve never played cribbage, you’re missing out on one of the great card games. There is strategy, point values, decision-making and math skills. . .all in one game. Believe us, we know that there are people rolling their eyes at the thought of having to count—numbers—in their heads! STOP THE PRESSES!!! You mean people actually count numbers in their–head? What a concept!!! To add to the reminiscence. . .we opened a bottle of wine tonight that seemed appropriate for the discussion, it’s a 2010 Cabernet Sauvignon from the Queen of Hearts from the Lucas & Lewellen vineyards in Santa Barbara County! From the Lucas & Lewellen Winery, “The grapes for this wine were grown in our Valley View Vineyard across a slope that undulates down toward the Santa Ynez River. The vines are trellised and the leaves managed to allow the perfect amount of sunlight in. The skins and tannins ripen fully producing a beautiful silky wine. Each lot is carefully nurtured in the barrel for nearly two years, then masterfully blended and bottled on our premises. Characteristics of blackberry and mulberry along with hints of vanilla and tobacco lead to a smooth ‘cassis-like’ finish. There are also spicy notes of licorice and baking spices. 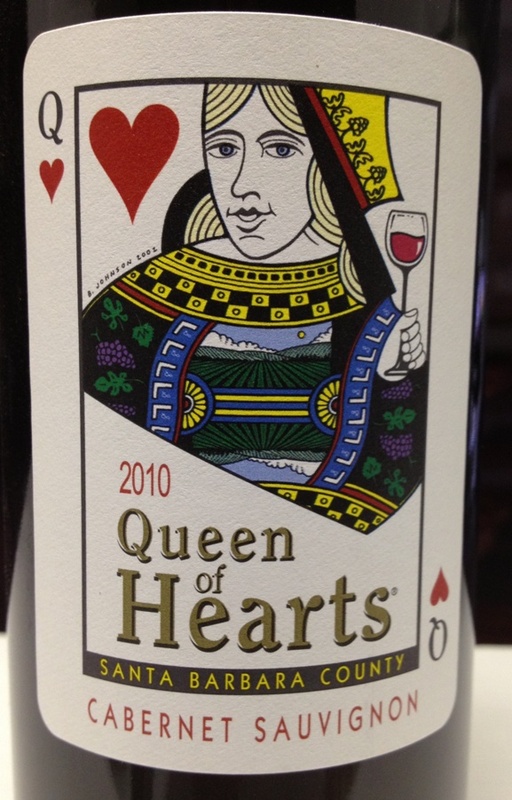 Enjoy Queen of Hearts Cabernet with beef, lamb, pork and vegetarian cuisine.” With a price point under $12 a bottle, you’ve got a little gem for a little cash here. Surprisingly, the wine had moxie from the minute it was opened. . .it exhibited a beautiful nose of fruit, smoke and tobacco. The taste was a little more complicated as it was amazing on the front of the palate, but it failed to live up to its’ expectations on the finish. Other than those two comments, this wine is pretty fine! While the wine is decent for the money, we’d probably look elsewhere to stock our shelves with good deck wine! Looking back on the times we spent with Jean’s Mom and Dad playing cards, there are times that we long for those days. Everything was simpler then; the pressures of everyday living were different, and having parents provide their insight–well, it just made things better. While enjoying your favorite wine won’t always make things better, it will help you to enjoy the moment just a little more–so please enjoy it responsibly, and while you’re at it , remember to recycle whenever possible. Categories: Uncategorized | Tags: Cribbage, Lucas & Lewellen vineyards, Quuen of Hearts Winery | Permalink.